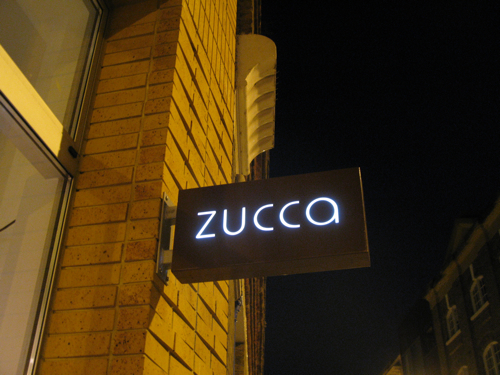 If you want to see the model for a truly great neighbourhood Italian restaurant, head down to Zucca on Bermondsey Street. Its only been open barely a few months, but it’s already lured me back for a return visit. If it wasn’t a little difficult to get a dinner table there before 9pm given its already loyal following of clientele, I’d happily be back there again in a jiffy to enjoy its daily, ever-changing menu of Italian classics. 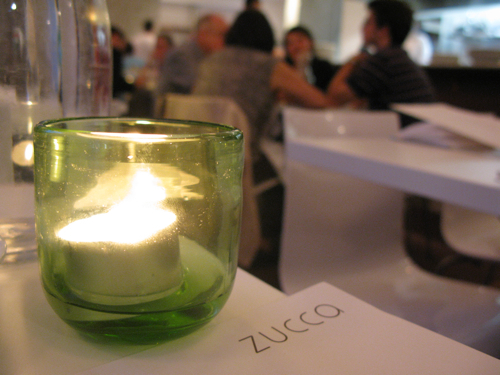 What you will get at Zucca is exquisite simplicity. The drama of its open-theatre kitchen forms quite the backdrop for its gloss-white, minimalist dining space. The food on offer here is a purists’ dream come true. Fresh, seasonal Italian produce… simple, great-tasting combinations… and most of all incredible value for money. With all starters priced under £4 and not a single main course more than £13, it blows other Italian restaurants out of the water in the affordability department. 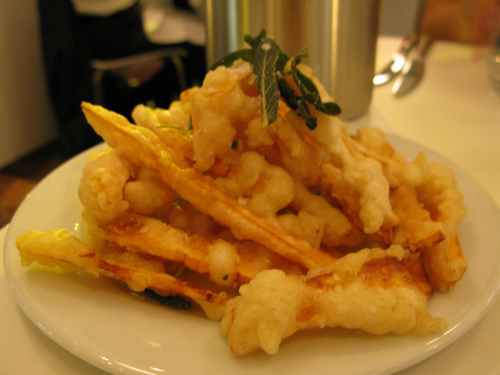 The namesake antipasti dish of Zucca friti is a must – bite-size pumpkin fritters, deep-fried to perfection in a crispy air-light tempura batter. The savoury, crispy sage leaves and generous sprinkling of course sea salt on top of the fritters are the icing on the cake. 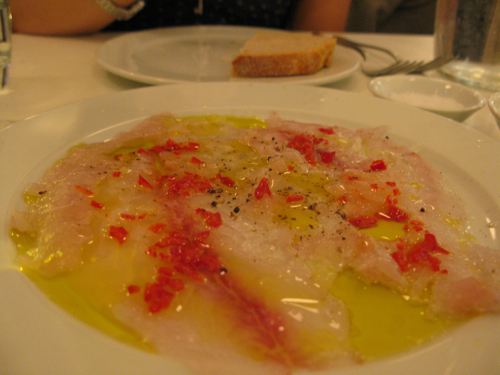 Seabass Carpaccio could be mistaken for a work of Renaissance art… the pale pink flesh of the wafer thin seabass slices form a blank canvas for freshly chopped red chilli, lemon juice and a splash of extremely fruity, extra virgin olive oil. Delicious. 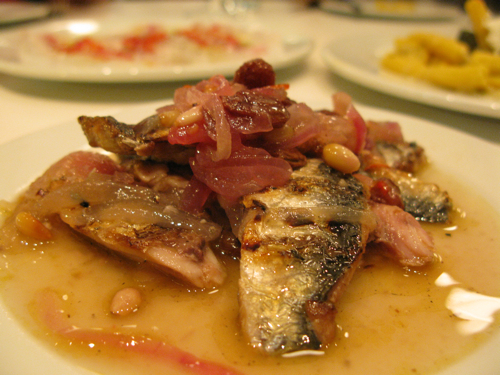 Grilled Sardines “Sweet and Sour” is as it says on the tin, an explosion of flavours. The rich, savoury sardine fillets are complemented beautifully by the sweet red-onion and raisin relish. 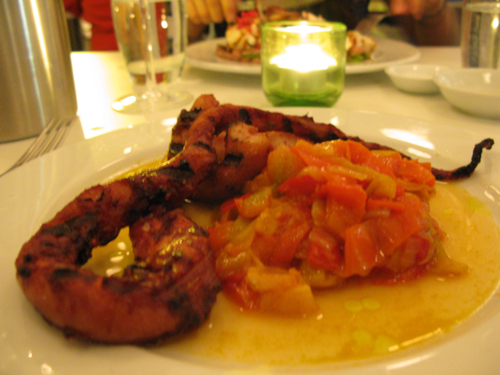 The main courses are just as brilliant. No gimmicks – just generous portions of simple, rustic and honest food. 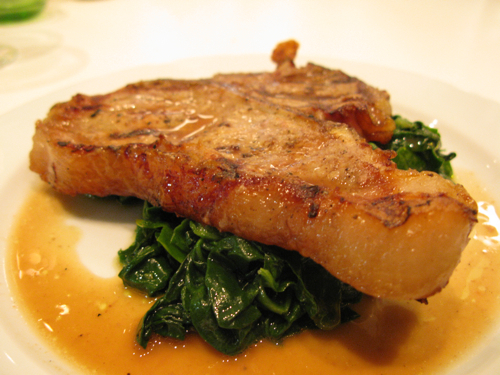 All of them were a joy to eat, but I’m compelled to say a few words about the Veal Chop, because boy-is-it-divine. The whopper of a Chop was well-seasoned and cooked medium to perfection. Marblings of fat throughout kept the Veal wonderfully juicy and tender. And just at the point when the carnivorous flavours started to saturate on the palate, on comes a kick of lemon from the spinach to cut to through the richness of the meat. Judging from the number of Veal Chops being dished out of the kitchen, I suspect its becoming a bit of a star dish here along with with Zucca fritti. 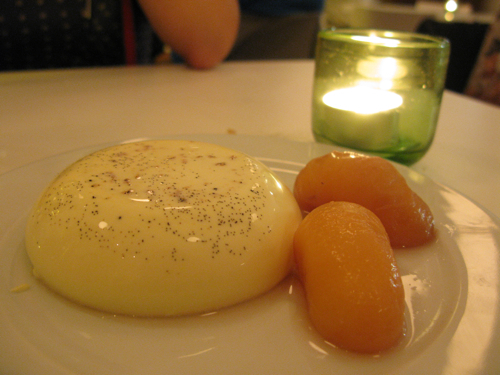 If you still have room to take on dessert, Zucca do a small selection of seasonal puds including a mean Panna Cotta that is packed brimful of fresh vanilla pods, served with poached seasonal fruit. 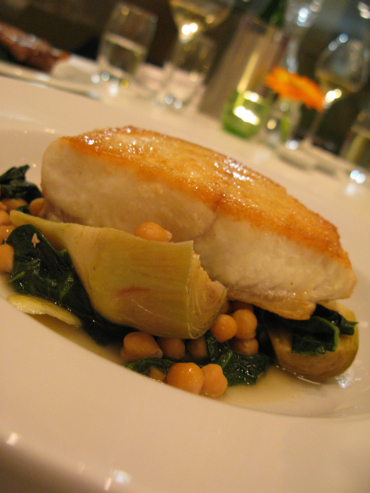 It’s one that is sure to cap off your meal on a high-note. 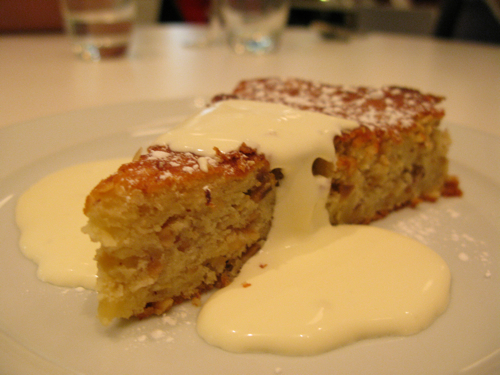 Their Hazelnut and Ricotta Cake which we sampled on our 2nd visit back was moist and flavourful. Pleasant on the whole, but i was left wishing for the Panna Cotta from first time round. 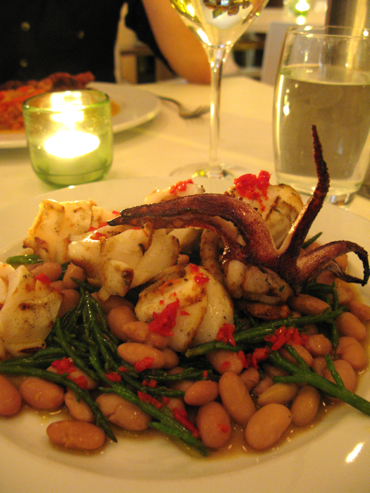 With such gorgeous food, faultless service and unbeatable value, chalk Zucca up along with the rest of the great neighbourhood Italian eateries such as Il Bordello where I will no doubt be a regular for the years to come.